Usually after an overseas trip with the family, I will make a list of suitable activities or places to bring kids in that country. In case you miss it , here are some of the lists that were made. Being frequent visitors to Tokyo (5 years in a row!) , it would be rather lame to make a similar 'Tokyo for Kids' post. On the contrary, having made several 'Holiday for Kids' lists, we were often asked about the itinerary. Thus for this post, it is time to do it a little differently and listen to our readers' requests. Here is a one week itinerary for those planning a trip to Tokyo. We took the Red Eye Flight from Singapore and landed at Tokyo at 7am + . There was a reason why it was called the red eye flight. Our eyes were literally red from the lack of sleep during the flight. However, that did not stop us from kick starting our vacation with a bang. The hotel chosen for this trip is at Hilton Odaiba. To get there from the airport directly, use the Airport Limousine Bus. Just book the tickets at the counter (found immediately after immigration exit). Get return tickets as they are at a discounted rate. For kids under 6 , it will be free. The caveat is that the child will need to sit on the adult if the bus is full. When we were there, the bus was not even half filled so you might get lucky and find your child a sear. The hotel was purposely chosen because of the numerous attractions within walking distance around the hotel in Odaiba. That meant we can just leave our bags at the hotel and start the holiday straight away. They said a hungry man is an angry man, so we were glad to get our hunger pangs resolved. No one wants to have a sleepy and hungry family roaming the streets of Odaiba ala Zombies. If you are looking for Eggs dishes, pancakes and more, this would be the perfect place for breakfast. We loved it so much that we went back for seconds during our trip. When you are at Odaiba, it is a must that you take a photo with the mini Statue of Liberty as your backdrop. That way you can tell people you have been to New York and most cannot tell the difference from that shot. No lah, it was just a very cool thing to do in Odaiba. That and a picture with Gundam at Diver City. After 2 attractions, you might think we were done. However since our rooms were not ready, we decided to take a VERY long walk from Aquacity to National Museum of Emerging Science. In honest truth, we could not figure out most of the exhibits. The only thing that caught our eyes was the performance of OSIMO - The walking / running / jumping robot. We walked from morning till night... not too difficult given that the sun sets at around 5 pm during winter. Nonetheless the walking bit was about the combine distance we usually walk in Singapore for a week... or maybe a month. Prepare for a good exercise workout. I lost 2 kg after the trip. We adored the sights and sounds of Odaiba. Among the other areas in Tokyo, this was probably the best place to stay with young kids. As night fell, it was time to address our red eye issue and we were promptly knock out on the bed by 9pm. Mahima Station (Keiyo Line) or Disney Shuttle from selected hotels. Every rides that you can afford to wait and every shows that you can watch. One day visit would usually NOT cover all rides, so plan and do not be ambitious. The next day we were up and early to hop on our Good neigbour bus from the Hotel to Disneyland. Forget about covering Disneyland in one day when travelling with kids. Instead go for rides with the shortest queue to maximise your visit . Wthe best was is to play by ear . Any rides that is 10 minutes long, we would queue for it. Being the happiest place in Tokyo, it was not surprising to see smiles all around the park. From visitors to performers, everyone seemed to enjoy themselves in the Park. Needless to say, so did we. Little Lou even made a wish at Disney Wishing well for more trips back to Tokyo. 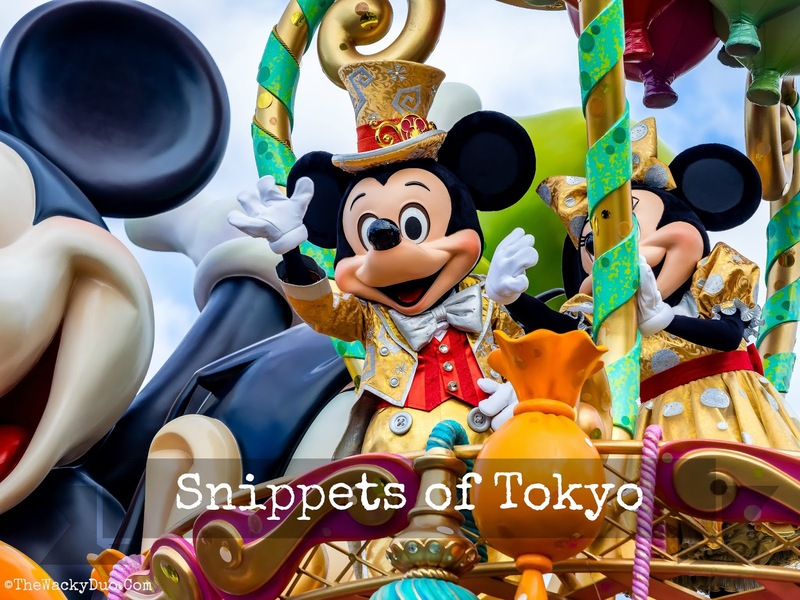 Disneyland is a must-do on the list especially if you have not been to Tokyo Disneyland. Any rides and every rides you can afford to wait. 2 must do things are taking a ride at Toy Story Mania and watching Fantastmic. With a 'live' Volcano as your backdrop, Disneysea provided a fairy tale like getaway for a day. Since Tokyo is the only Asia destination with Disneysea, it would provide a fresh perspective to Disneyland for new visitors. For one, Duffy the Bear was very prominent in Disneysea and would probably be a novelty to tourists. It is ok not to know who Duffy is for new visitors, since he is only native to Disneysea. In terms of rides, most would agree the rides in Disneysea would be more exciting and fun. This is especially so with rides such as the mini roller coaster. Adults will probably seek their thrills at Lost River Delta with the Indiana Jones ride and Raging River ride. And the best ride on the park? Everyone will agree that the best ride in Disneysea or even Disneyland would be Toy Story Mania. It was so shiok that we turned into Martians after the ride. Speaking about magic, don't miss the excellent Fantasmic where Magic Mickey will perform in the Sea. May Magic Mickey can change us back to humans after the show? Ueno is a one stop place that oozed cultural with its museums and galleries. Most of the places are affordable with entrance fees below 1000 JPY for adults. Kids are also provided free entry to certain attractions, making this a very affordable place to visit. Walk through the beautiful Ueno Park to get to your destination. The Autumn leaves on the trees made the walk a surreal experience. For our trip , we made a pit stop at National Museum of Nature and Science. Kids under 12 enters for free. Even though it was free, the quality of exhibitions was surprisingly impressive. Our favorite will be the floors of dinosaurs on exhibit. There was even a complimentary indoor playground with T Rex over watching the kids. Try to squeeze in a visit to the Zoo as well. Kids get in free and there are areas of the zoos that allows the children to interact with animals. If you want to visit ALL of the above, a day might just not be enough to see everything. On the way back, we made our way to Akibara. If you do not know, Akibara is the mecca for electronics, maid cafes and arcades in Tokyo. Quirky things can be found around the place. We spotted a pair of Samurai inspired Boba Fett and Jango Fettt. This pair of samurais will leave Star Wars fans go gaga. A little secret, make a visit to Yobobashi Camera. Go straight to the 6th Floor and you will be in a Toy Mecca. There are various toys from Japan found there. For LEGO fans, Lego are 30% off retail price. Bring your passport along for further 8% Tourist GST refunds. Use VISA to get additonal 5% off, You would save a pretty penny compared to buying toys from Toys 'R' Us. We made our way back to Odaiba before night fall to have a go at the UFO Catchers. As huge fans of the claw catching and author of how to win at UFO Catcher, how can we miss a visit to the arcade for this experience? At the end of the day,we walked away with a few toys and a much lighter pocket.Guess we had not lost our midas touch. Do note that these centers are close to kids after 6pm, so do get there early if you would like to try your luck with kids. After a day of cultural exposure, it was time to venture out of Tokyo to the nearby City, Yokohama. Getting to Yokohama was a breeze. It took u approximately 30 mins from Tokoyo to reach there. One of the ways we navigate was via Google Maps. A special thanks to Changi Recommends Wifi Router that helped us stay connected throughout this trip. We were delighted that it even worked in Yokohama! Our original intention was to head to Cosmo World for a day of rides and fun. Alas the place was CLOSED on a bright sunny day because of strong winds. It just blew us away, having traveled for an hour plus just to get here. Thankfully we never give up and found the Cup Noodle Museum right next to it! It was a delight for the boys making their own personalised cup noddles at the Cup Noodle Museum. They even got to choose their own flavours.The cup noodles comes 'protected in a vacuum bag. Sadly it had to be deflated prior boarding the plane home. There are many other things to do in Yokohama. The Yokohama Port Museum is just round the corner. Chinatown and the Red Brick Warehouse are also within walking distance. Unfortunately , I was too adventurous to suggest a trek to Nogeyama Zoo, located about 2 km away. It was a task made impossible as it was up a hill. With the younger one enjoying his siesta, carrying a 28kg boy up a steep slope was too much for the retired NS Men. Even my fullpack weighed less than that. A 30 minutes journey slowly evolve to an hour plus walk. Thankfully I got sane halfway and aborted the mission. It also mean an hour was wasted and we had to head back to Tokyo without doing much in Yokohama. Lesson learn - always have Plan B. It was back to cultural activities today with a visit to Sensoji Temple. This is the most popular and colourful temple in Tokyo. Shops are line up on both sides of the street leading up to the main temple. It was probably a tourist trap but we felt for it. The boys ended up with a couple of Ice cream on the 200m walk on the shopping street known as Nakamise on the way to the Temple. The temple itself was iconic , but kids would probably not enjoy it as much as adults. To add a little distraction along the way, head to the Drum Museum located down the main road. We skipped that during this trip, but the boys had a noisy time when we last visited. You can beat selected drums to your heart content there. A must visit for fans of drums. Since it was our last full day in Tokyo, we decided to head down to Tokyo Dome. We heard that it housed an amusement park within the city. It was not as big or modern as Disneyland, but it does have some fun rides for the kids.We even tried Bungee Jumping where one get propel upwards to as high as 25 feet in the air. There were no entrance fees and rides are as per charge. It may sound like a great deal , but it does adds up. A family of 4 in one ride could easily cost $30 upwards. Multiply it by 10 rides and you can possibly spend more than you would at Disneyland. Sadly in the interest of dwindling cash, I had to limit the rides and let the boys sat on their own for the rides. Night arrived too soon ( did I mention it was Winter) and it was time to head back to the hotel. As a treat I decided to set some fireworks off right when the train was crossing the Rainbow Bridge. It was indeed a magnificent sight watching Fireworks from a soundproof train. No bang bang, just blink blink. I was kidding about the treat, we were just lucky to be there at the right time. It was time to say goodbye to Tokyo. Since we were taking a late evening flight, there was still some time to catch up with last minute shopping. Plenty of good deals since JPY is considerably weaker compared to a few years back. I manged to snagged a pair of Nippon Made Onitsuka Tiger Mexio 66 in Harijuku Black...pardon the long name. I was eyeing a pair of Nippon Made shoes for the longest time and at almost half the retail price in Singapore , it was a great deal. Like the saying goes, all good things must come to an end. After 5 consecutive years of Tokyo during December school holidays, it will be time to change a new destination next year. Do not get us wrong, we love the city, but it is time to see what other surprises Japan has to offer. Hokkaido, we are coming for you next year! All expenses on this trip are from our own pockets. If you like what we do for this post, do support us by clicking on the affiliated links above. All the cost will be the same as the website. TWD will get a small remuneration for the tours booked in return.